The 24-year-old singer's ex-girlfriend Briana Jungwirth is believed to have given birth to a baby boy in Los Angeles on Thursday (21Jan16), and now his stepdad has fuelled the gossip on social media. Mark Tomlinson wrote on Twitter, "Is that the patter of tiny feet?" Meanwhile, a source close to the boy band star, who is currently on hiatus from the group, tells People.com the baby is "perfect". Louis briefly dated the stylist last May (15), following his split from longtime girlfriend Eleanor Calder. He has since been linked to actress Danielle Campbell. A representative for Louis has yet to comment on the alleged arrival of his newborn. 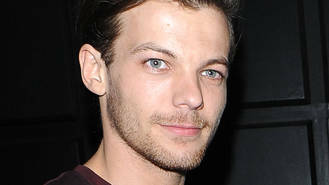 Louis is estranged from his hereditary father, Troy Austin, and the singer adopted Mark's family name after he married the star's mother, Johannah Poulston. The 24-year-old musician and his 47-year-old dad are not speaking currently, with reports suggesting their relationship has been fractured for years. Troy has experienced a tragic decline within the past year or so, with British newspaper The Sun having reported he attempted suicide last August (15). In light of Louis' baby news, Troy has become desperate to reunite with his son. "I'd like to be involved in my grandchild's life," Troy told UK publication the Daily Mirror in July (15). "I've missed out on Louis' life and I'd like to make up for that. It's time to heal the rift."